Bio-Oil will be launching their biggest size -200ml in Singapore in May 2015! I’m honoured to be one of the invited guests to attend the Hands-On ‘Create’ Beauty Workshop and met Ms Wendy Jacobs & her daughter Iman. Opening speech by Ms Low from Bio-Oil. She mentioned Bio-Oil in South Africa is just like Tiger Balm to Singapore. Almost every household in South Africa will have at least a bottle at home. Improve the appearance of new and old scars, whether from surgery, accidents, burns, insect bites, scratches, cuts or conditions such as acne or chickenpox. Although younger scar will have a greater chance of improvement, studies have shown that older scars also benefited from regular use of Bio-Oil. Ms Wendy Jacobs shared with us the tips of using Bio-Oil and how she use it in her daily life. She shared, not just for skin, Bio-Oil is also can be used as hair mask! South African uses mayonnaise as their haircare ingredients, yes mayonnaise! I didn’t hear wrongly, add some bio-oil together with mayonnaise it works wonder for them! Iman Fandi Ahmad gave us some healthy tips like say no to junk food. Surprisingly, teenage girl like her doesn’t touch any junk food, she drinks lemon water everyday and encourage her family members to do so. She also demonstrated and shared with us the steps of making Natural Facial Scrub by using Bio-Oil as one of the ingredients. With some simple ingredients you can enjoy your very own spa at home! Add all ingredients together in a large bowl and mix it. To use the scrub, wet your skin first (water activates the hydrogen peroxide in the honey), scrub it over your face and wash off. Amazing instant results after using the scrub. Fine lines reduced, skin got smoother and supple. No time for spa treatment? Bio-Oil invites you to create your own Bio-Oil infused home remedies. Feed your skin with manuka honey and give your face a healthy glow. Not only does honey taste great with your tea and pancakes, it also beneficial for your skin. Manuka is a monofloral honey obtained from bees that pollinate the manuka bush. Manuka honey works wonders for blemished and inflamed skin due to its anti-bacterial and anti-inflammatory properties, plus as a natural humectant, it also helps increase hydration to the skin. Love the zesty wake-me up sensation that lemon has? Indulge your skin with lemons and allow your skin to detoxify and rejuvenate. Rich in Vitamin C and Citric acid, lemons pack a huge punch to fight free radicals and are often used to brighten up dull skin. Apart from reviving tired-looking skin, it also has antiseptic properties to help treat acne and various skin disorders, as well as reducing excessive oil on the skin. dead skin cells. Different from the usual table salt, Himalayan sea salt is mined from ancient sea beds. It is untainted by toxins and provides a rich source of trace minerals that will feed your skin and achieve a smooth and youthful skin. Since the workshop was held at Cookyn Inc, how can we miss out cooking demo. Cookyn Inc’s staff demonstrate Baked king salmon in a parcel with smoked duck & assorted vegetables to us. We get to enjoy this healthy and hearty dish after the cooking demo. Thanks Melodie for the fun and enjoyable hands-on workshop. I enjoyed myself very much and gained some useful beauty tips and knowledge. 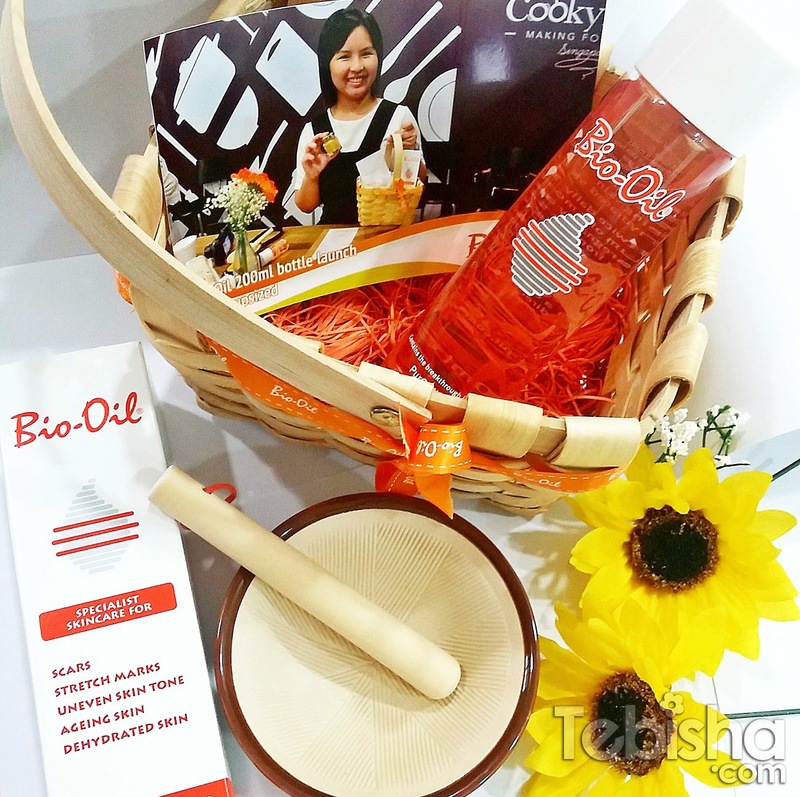 We get to bring home a special basket of Bio-Oil love from the team. I’m now using Bio-Oil daily, will review and show the results after 1 month. Stay tune for my blog post. Bio-Oil upsized 200ml retail at $35.90 and will be available at all leading pharmacies, department stores and hospitals from May 2015 onwards!